VANCOUVER — Members of the Vancouver Transportation Benefit District Board of Directors voted Monday night to increase the annual vehicle licensing fee for vehicles registered within the city’s transportation benefit district from $20 to $40. The Transportation Benefit District (TBD) was established in 2015 and was intended to address the upkeep of roads and streets within the city of Vancouver. It helps fund these projects in part through an annual vehicle license fee. According to Chris Malone, Vancouver’s public works finance and asset manager, the vehicle licensing fee was first initiated in 2016, and was set at $20. From the beginning, it was planned that a “phased increase” to the fee would be enacted. State law required a two-year waiting period from the establishment of the fee until any fee increases could be made. The increase to $40 in 2018 will be “continuing the long term plan” for the Transportation Benefit District, Malone said. Chairman Timothy Leavitt added that “everybody needs to pay their fair share” to help keep the city’s roads in good repair. The board members unanimously passed the fee increase, and the updated fees will be enacted no sooner than six months from the board’s vote of approval. During the meeting, the board members also passed a resolution to approve the 2018 budget and project list for the transportation benefit district. A total of $3,600,000 will be generated from the TBD vehicle licensing fee. When combined with the existing fund balance, Malone said, there will be approximately $5,503,500 available, and the estimated expenditures from the transportation benefit district will be $2,800,000, leaving the ending fund balance for 2018 at $2,703,500. Five projects were identified for funding, with a total estimated project cost of $14,285,000. Of that cost, only $2,800,000 is funded by the transportation benefit district. The rest of the funding comes from other sources such as grants, business licenses, utility taxes, state fuel taxes and debt service retirement. Board member Bart Hansen noted that one of the projects, multimodal safety and accessibility, which concerns sidewalk improvements and access for people with disabilities, had $0 from other funding, all of its funding came from the TBD. 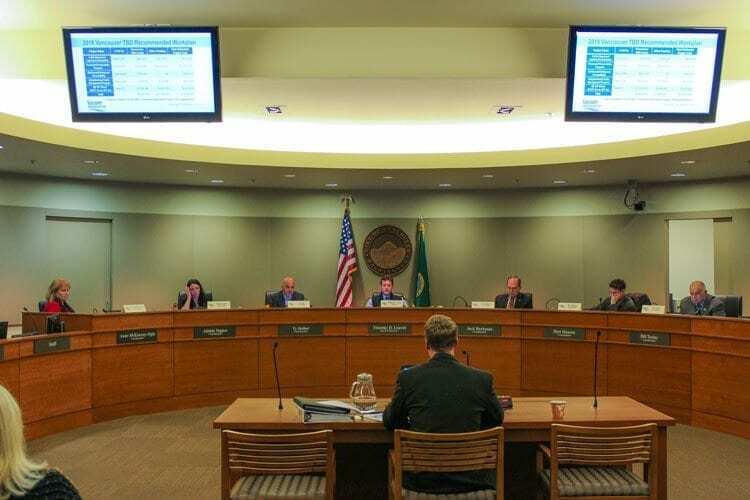 Hansen questioned whether other funding could better suit the budget item, and if the $500,000 earmarked from the transportation benefit district could be better used elsewhere. Malone said that last year, the multimodal safety and accessibility budget item received a $200,000 grant, but this year so far it has not received any grants or been allocated any other funds. Hansen said that the lack of other funding besides the TBD for the budget item was why he did not support the proposed budget. The board members approved the 2018 TBD budget and project list, with Hansen being the only no vote.